OMD - Rob's got a new camera! 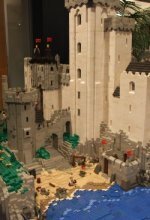 In January of last year (at Brickvention) my trusty Fuji camera took it’s last photo. It had been with me for years, so old as it was, it was sad to see it die. My plan had been to replace it, I was just looking around for a good deal - which I finally found late last year. 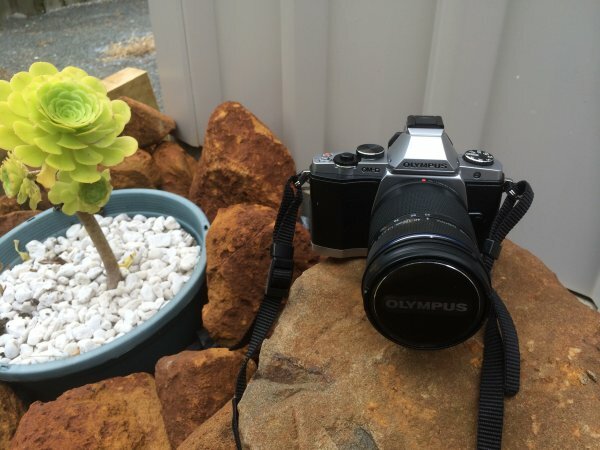 Say hello to my new Olympus OMD EM-5. It’s not quite a DSLR officially as it’s mirror-less (electronic viewfinder), but that doesn’t make it a low end camera. It’s a Micro-Four-Thirds camera, which packs in most of the features of a DSLR into a much smaller format. I haven’t done much with it yet - and the capabilities of the camera will far exceed my skill in using it - but I’m thrilled to finally have a camera with changeable lenses. I should be able to get better effects with my Lego photography now. Oh, and of course - the camera is awesomely retro-looking. It looks like you could throw a roll of film in it. 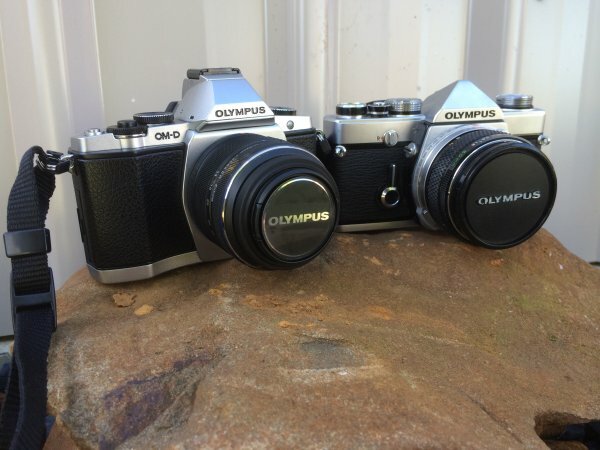 In fact, my mate from work brought in his OM-1, which is an older Olympus film camera - it’s easy to see the resemblance! The EM-5 (mine) came in black, or silver and black. It doesn’t look bad in black, but the silver is just plain awesome and gives it the fantastic retro look. That held me up for a bit as the silver ones are scarce now, but it was worth persevering. In fact my workmate was so impressed by my EM-5, he went and bought himself an EM-1 (the top of the line OMD - twice the price of mine). And just cause we could, here’s a family photo. 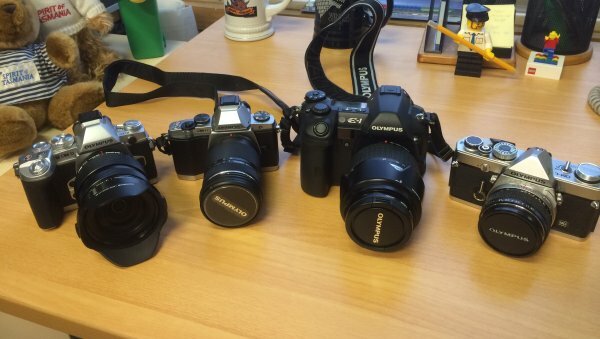 From left to right it’s Steve’s OMD EM-1, my OMD EM-5, Steve’s E-1 (Olympus’s first DSLR), and the film OM-1. Unfortunately, as the camera was the star of these photos, it didn’t actually take any of them. But you’ll see plenty of photos it does take soon. 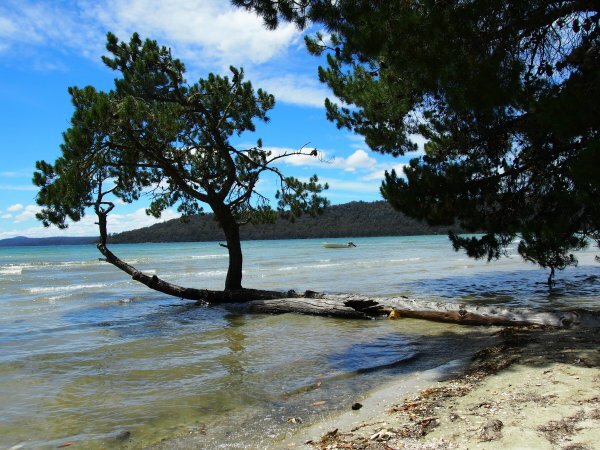 Spent an awesome Christmas down on my favourite beach. It was a fantastic time camping with family – it’s a real shame to be home and heading to work tomorrow. It is with great sadness that I report the apparent death of the legendary Zombie Mower. Years ago when I first got a house, I realised I needed a mower. 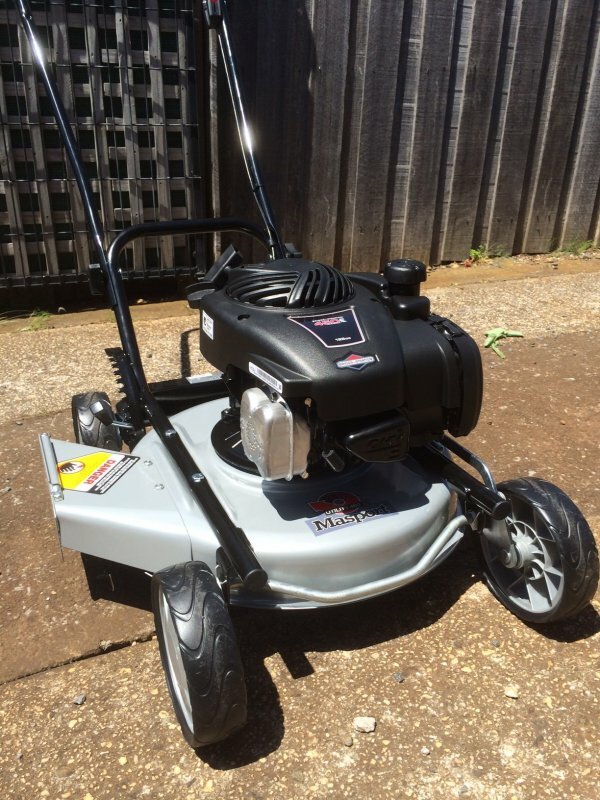 So off to Bunnings I went, and got the cheapest mower I could find at the time. The mower had a catcher, and mulcher, and a side-throw option. The catcher lasted about two laps around the lawn (I had to empty it twice by then) before I gave up. The mulcher option lasted slightly longer until it bogged down and stalled - so I used the side-throw, and that’s all I’ve used since. The mower acquired the name Zombie Mower after it exploded in smoke for the second time. It should have been dead - but it kept going. In fact, it should have been dead many times over - but it kept trucking on. All the plastic safety equipment had fallen off years ago, the throttle was stuck on at 120% (which meant it drank lots of fuel), but the thing that finally killed it was when the petrol tank fell off. I did reattach the tank, but something has gone wrong with the pump mechanism - you can prime it by hand and it’ll start for a moment, but it can’t feed itself anymore. So I headed to the hardware again to get a replacement. But alas, none of the mowers had a side-throw option. Lots of catchers, a few mulchers, but nothing with a side-throw. Mulchers and catchers are fine if you’re the sort of nut who mows every second day, but if you let the grass get a bit longer/thicker, they are useless. So I ended up hunting around the mower shops instead of the hardware ones. Turns out that the official name for a side-throw mower is a "utility mower" and is basically the domain of commercial mowers. Side-throws are available, but they are expensive. While considering one of the commercial mowers (I was getting a little desperate as my jungle needed mowing rather seriously by this point) the salesman showed me a brochure for it. As well as the model I was looking at, they had smaller utilities. I asked if they could get one of them in, and turns out they had one in the back. 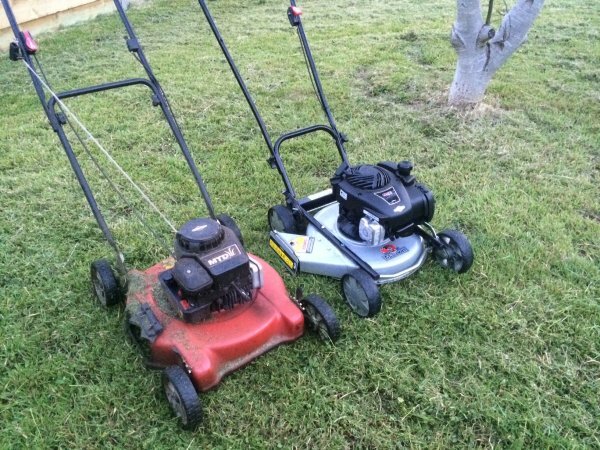 So I now own a small semi-commercial utility mower. It actually looks smaller than the zombie mower - but doesn’t take too long to mow the lawn. Wether it will live to aquire the legendary status of the zombie mower I don’t yet know. At least my lawn can be mown again now. It’s been a while since I last posted - and things have been happening since then. 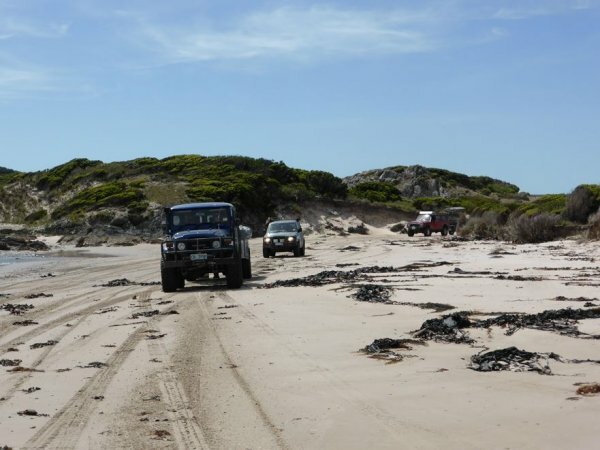 I joined the 4wd Club for the annual trip to Sandy Cape a couple of weekends back, which was awesome (aside from some suspected food poisoning). But there’s also the other small news that I have a housemate again! Turkeybrain (aka Martin) has moved in, as he’s managed to score a job in Burnie. This is keeping me entertained because there’s a lot of Dota happening (whether watching pro matches or playing ourselves) as well as finalising the reorganizing of the house to accommodate him. As my Lego Room is now Turkey’s room, the Lego had to be moved, and this time I’ve done it a bit more seriously than the last time Chris moved in - so it’s taken time. Over the years I’ve done the drive from Bellingham to Bridport (or vice versa) a number of times. It’s a great spot to visit for the day or camp (although I haven’t done that yet). Unfortunately a few weeks back a group of idiots went in there for the weekend. 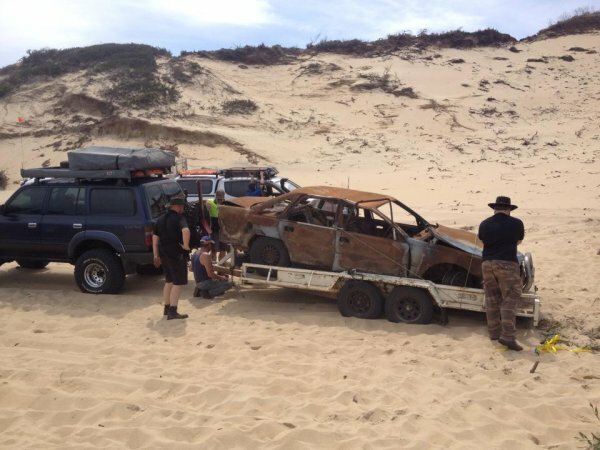 They managed to drag in some 2-wheel drive vehicles and flogged them around on the sand. When the cars finally died, they set them on fire and left the wrecks there. They also left a lot of general rubbish around the campsites. 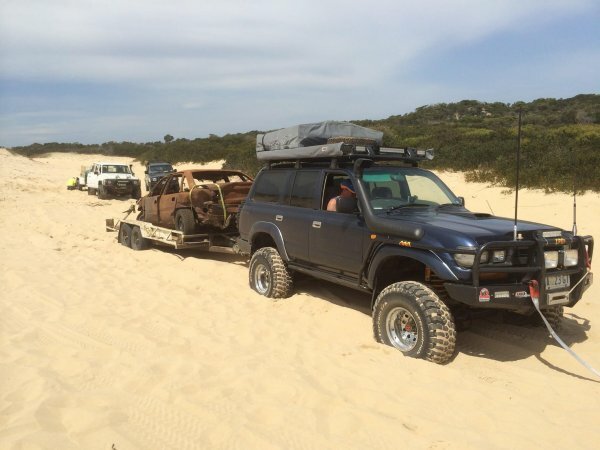 So up steps the local 4wd clubs who don’t want to see the place trashed like that or have access shut down entirely - so they organized a couple of trips to get the car wrecks out and do a general cleanup. The first trip (organized by some Launnie clubs) was when I was on call, but the second one was on Saturday and organised by the Devonport club. About 5 cars from Devonport and a few more from Launnie arrived at Bellingham and headed out. As well as dragging the dead car out (which wasn’t easy on the very soft sand) we also brought out about two and a half trailer loads of general rubbish. It was a great day out with a group of people who were keen to clean the place up - but it was disappointing to see how low and uncaring the people who left that much stuff are. It’s a pity we all get painted with the same brush by the general public.